A rare made-for-TV mini-series which originally aired on Japanese television in 1968. The dragon Agon rises from the ocean and wreaks havoc on Japan. 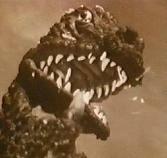 He breaths fire, destroys buildings and stomps the Japanese military. (In Japanese language).